INK is a game that's seen a release on other platforms in the latter half of last year. Now, it arrives on the Nintendo Switch with an exclusive 2-player mode. Will this game color you surprised with its quality in a positive way... or a negative one? SuperPhillip Central's INK review seeks to answer that for you. Not ink-credible, but not ink-croaching into bad territory either. INK is an interesting 2D platformer that has your vessel, a square of paint, moving through levels to reach the goal. What differentiates INK from being just another 2D platformer is the paint mechanic that is the central focus of the game. Starting off in a level, the actual platforms and geometry inside is completely camouflaged in darkness. 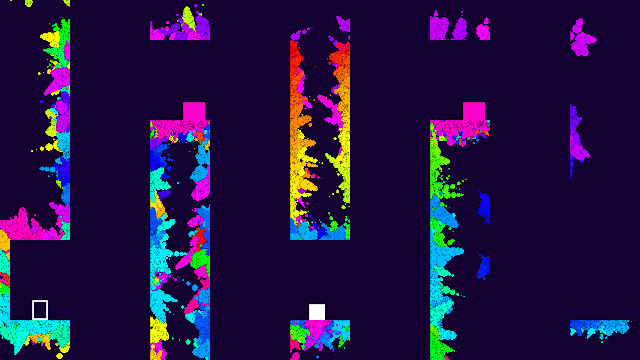 In order to find a path through, you need to squirt multicolored ink throughout the level, getting it on the platforms' surfaces to make out where you need to jump, scale walls, among other platforming activities. Nothing's mattering when you're smattering of splattering goes on. The first handful of levels of INK's 75 individual challenges greets players with a tutorial of sorts, showcasing the objective of levels and what your block of ink can do--whether it's a simple jump, a double jump that squishes out ink to surrounding areas, leaping up and sliding down walls, and reaching each level's conclusion. After the initial five or so levels have seen completion, you get right into the thick of things. Some levels are as simple as venturing through the dark, inking up walls, floors and ceilings in order to get an idea on where platforms are and where bottomless pits and other hazards, such as spikes, hide. Then, it's just a matter of getting the goal. Other levels require you to defeat every single enemy in the level with a simple jump on their blocky heads, something made a little more challenging than it needs to be due to INK possessing a playable character that has slippery and floaty movement. Add this with some spotty hit detection, and you have a sometimes frustrating go of it at times. Thankfully, levels are short, and these can be beaten usually in less than 30 seconds. 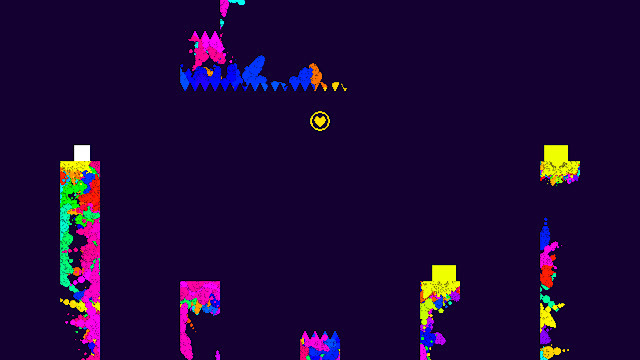 In addition to that, when you die (and you WILL die... A LOT), all of your ink splatter remains visible, so you need not repaint areas of level all over again when you retry a level after failing it. Only when you back out into the main menu will levels return to their original state. That said, enemies always return after you die. After all, the developer definitely needed to keep the game at a high enough range of difficulty, right? Death is a reoccurring theme in INK, as there are several "gotcha" moments to be found in the game. Elements like platforms that swiftly rise or fall after the enemy on top of them is defeated, invisible spikes that only appear after you ink them (whether it's from manually doing so or automatically when you are blown apart upon touching them), and just ever so as much as grazing the boundaries of a given level will all lead you to an unplanned and quick meeting with death. 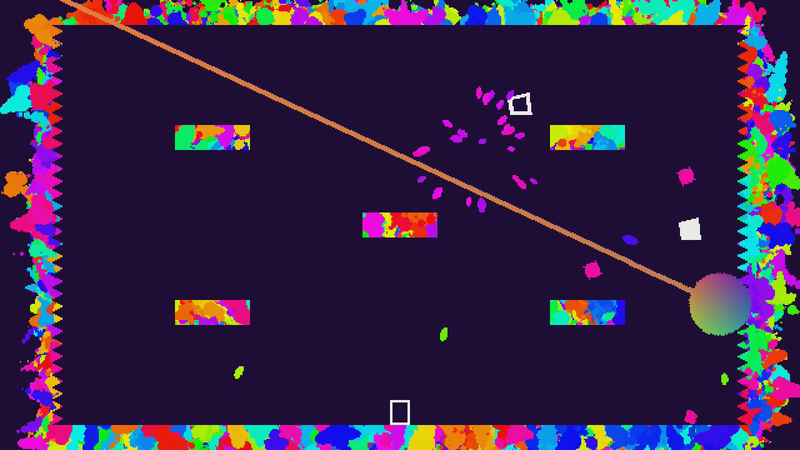 The 75 levels get quite arduous to complete in the latter half of the game, complete with the need to collect keys to unlock sections of level, sentries that shoot out homing shots that can be a challenge to avoid, myriad spikes, multiple bottomless pits, small platforms to precarious leap on and off from, and three boss fights that split up the traditional levels quite nicely, adding a different type of platforming into INK's colorful mix. At three different points during INK, a different boss inserts itself into the action. Not knowing where most level elements are in the game results in a lot of trial and error. You'll slowly but steadily make progress each time you die, but each death will usually yield another result: a frustrated sigh because you couldn't have possibly known there was a bed of spikes right above your block's head, especially when you've already died ten times and were basically at the very end of the level. Now, you have to do it all over again, but once again, at least you keep all that ink splashed all over the environment to more easily see your way through the level. INK doesn't have too much replay value to speak of. There are 20 hidden objects within the 75 levels, but the game gives no indication from what I've seen regarding which levels house collectibles and which don't, which makes searching for all 20 more of a hassle than fun. If you do wish to add to your play time, you can always attempt to find these collectibles--just remember that you have to collect them AND reach the goal in one life. A shared JoyCon mode with two players is also available in INK, and that can get quite hectic. Enjoyable, but quite hectic. Other than that, you can attempt speed runs through levels, record your runs via the Nintendo Switch's Capture button, and share them online through either Twitter or Facebook. There are 20 collectible coins to find in 20 of the 75 levels of INK. These require some discovery and lots of skill to collect and make it out of the level in one piece. After the dust has settled and the ink has all but dried up, INK is an entertaining little time-waster, but it's not much more than that. Its vivid visuals and chill soundtrack make for nice ambiance to run and jump to, but the actual running and jumping is marred by slippery handling and floaty jumping, on top of some occasionally poor hit detection. While it may sound like an awful combination, INK is actually worth checking out, especially at its relatively low price. INK won't make a big splash with most players, but it will have you enjoying yourself for longer than you might th-INK. Review code provided by Digerati.